According to a very nice book published by the vinery first wine was made at Batic since 16th century – by monks. Ivan Batic and his son understand themselves in the tradition of winemaking since some hundred years and the quality of wine I drank confirmes this. You can find all you like to know about Batic if you go on their perfect webpage: http://www.batic.si/. Sometimes it is senseless to write more about someone if is so well presented. Sempas is a small town in the Vipava valley in the western part of Slovenia, not far away from Italy. This area actually has been for long Austrian and it is interesting that there are still some villages and towns (in this region of Slovenia and Italy) have rather a German name than Slavic. Anyhow this is an ideal area of making wines and some of the best Slovenian wines are from there. 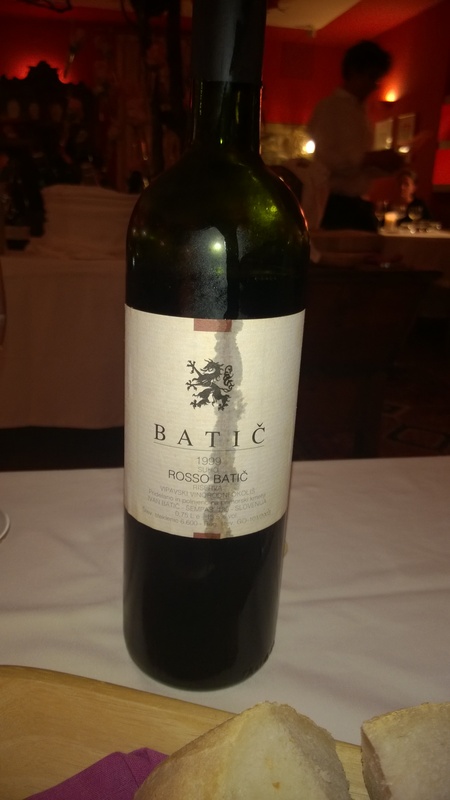 Unintentionally I have been introduced to an older vintage – 1999 – of Batic’s top wine which was probably called at this time only Reserva but now known as “Angel Red” – which is perhaps a bit too ambitious. It is a cuvee of Merlot, Cabernet Frank and Cabernet Sauvignon. Based on all what I read 1999 was a great vintage. And I only can say: I liked it very much! The dryness of Merlot is the basis but the extravagance of this wine comes from Cabernet Frank. Although it is really a dry wine – with aromas of tobacco, black tea and wooden berries – there is an amazing freshness as well. The wine in general has rather a rough note and cares some tannin. The gentleman who offered me this wine is one of Slovenian’s top sommeliers – Valter Kramar – who said that the wine became really better as older it gets. I can only imagine how wild this wine probably was when it was young. Now there is a well balance which makes it so enjoyable, special and rich of character. If you for any chance has access to an older vintage of this wine, give it some while to breath. The color of the wine is darkest red – strong as the wine although alcohol is on a reasonable level of 13,5% – comparing to other Slovenian reds. The wine is organic. I had some lamb with it but this wine should fit along many kind of food, not only red meat. Recently I wrote about Slovenian wine first time (see: https://avdwineandfood.wordpress.com/2015/04/14/movia-veliko-2006/) and there are more wines to be discovered of course. Most of the wines from Slovenia are not known. Only an elite of sommeliers, regional people and perhaps some freaks like me know about the quality and philosophy of winemaking in this country – which of course is somehow also a little bit in the shadow of Italy perhaps. It is probably a funny notice: Most of the estates of Slovenian winemakers are hidden. Beautiful older farm houses or even original vineries aren’t visible from the streets as they are surrounded by walls and stony backsides of house. Sometime only a smaller gate gives access to a nice yard and the house and work rooms. The way of building is due to tradition and related a lot to weather. Anyhow, sometimes it seems they way how this buildings are built, the wines need to be discovered and you either have the courage just to enter the gate or you find someone who leads you to the winemaker, who all of them probably have great passion for that what they do!